Yeh, OK not 100% sunny, but the weather this week has been just as good as any other time of year. You can never tell with the low season. On average, May is the 4th wettest month of the year, but averages are misleading. The average of 5 and 5 is 5. The average of 10 and 0 is 5. A very wet May followed by a dry May gives the same average as 2 averagely wet Mays. Well, this is a dry one! We're up to over 100mm, but it's pretty much all fallen in the night save for a few showers. Some gloriously sunny days recently, hardly any wind, great Phuket diving weather, great weather for doing anything you want. For daily weather updates plus useful links and certainly some unrelated nonsense - please do Follow me on Twitter! (above) stopped on the way home on the 18th to eat some noodles. This place is called Kuay Jap Champsuphan, it's in Kathu opposite the entrance to the Prince of Songkhla University. It's the second branch, just opened a few months ago. 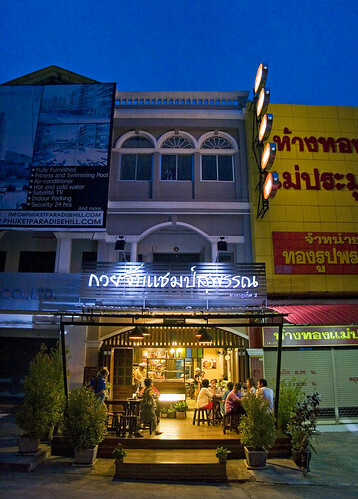 The first branch is at Sam Kong, in the north of Phuket Town near the big Tesco Lotus store. Friday was another perfect sunny day. 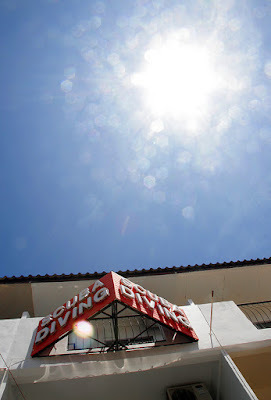 The photo below shows the sky over the dive shop. It's a bit frustrating running a dive shop in low season when the weather is like this, but there are hardly any divers around to take advantage! 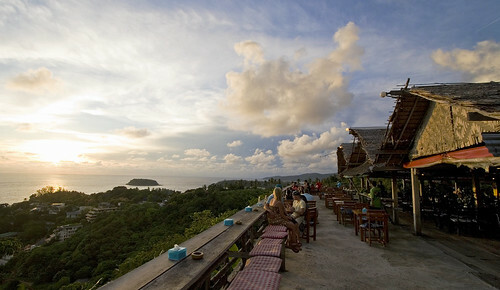 Now sometimes it's also frustrating working all day in a place like Phuket. I am not on holiday here, I work in a dive shop, normally 6 days per week. Blue skies - nice, but I am indoors.. although I do plan to go diving this week. And if the rain comes, it often comes just about when I finish work. But Friday was a lovely evening, so rather than head home, I went to the 'After Beach Bar' for a beer and a sunset. 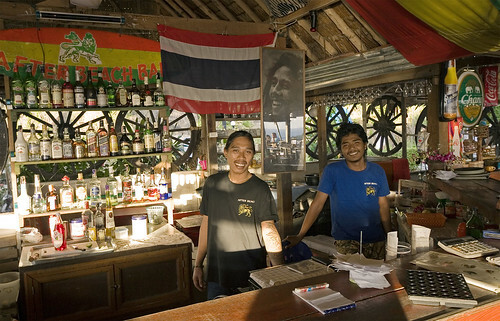 This place is a Phuket landmark, on the hillside just a few minutes drive from Kata beach, great view, cold beer and a bit of Bob Marley. It's sunny again this morning and was sunny yesterday. Low season? Well, it's got to come sometime.. there will be some rain and wind. Fact of life, but Phuket in the low season can be great and hotel prices are ridiculously low (have a look at Agoda for hotel prices and bookings). Low season may suit the tourist who likes to explore, rather than just "beach tourists"... you can still go out and take a drive on a cloudy or wet day. You can go explore Phuket Town, just carry a small umbrella and if the rain falls, stop in a cafe or something. If all you want is beach, low season is hit and miss, and you have to be careful of big waves at the beaches sometimes. Right, now I just hope this weather lasts all week. Plan to go diving on Wednesday with my wife. I work in a dive shop and have logged around 1500 dives, but have not dived actually for a couple of years. Have been stuck to a laptop! Please stay sunny!